I’m not really much of a roadie. But I will pedal around pretty much anything with wheels. As such, there’s usually something worth hearing in this podcast, but it’s not the greatest one out there. Looking for a cycling podcast, this was my first attempt with Fred, and the entire first 3 1/2 minutes were ad reads, couldn't handle any more, lost me. Dave has spent many hours keeping me company on my fitness rides. While he does not publish as often as he used to, his shows are always entertaining and well produced. I found him in the winter of 2006, so I have been along for the ride since the beginning. Yes, he is long winded, but is that not what you want from a podcaster? Plus he is talking about cycling which is why we are tuning in (response to Murgie). I have to say also as someone who disagrees with Dave on some issues, he is quick to respond to email and knows how to disagree without being disagreeable. In short, a great show for those long rides! David has a hand on the heart beat of cycling. Everything that is discussed is on topic. This includes being personal, and sharing his experiences with us. There is a great deal of information to cover in the cycling community, and David does a great job disseminating all the information out there and bringing to the table the information that is pertinent to me. This is a great Podcast, and a great way to stay in tune with the cycling community in general. I am new to cycling. I had not ridden a road bike since high school when at 55 I was selected for a cross country bike ride. I had just discovered podcasts a few months before and had used them to listen to IT-related topics (I'm a sysadmin). I was desperate for help when, on a whim I searched on "cycling" and found The Fredcast (and a few others. Thank goodness I did. Both of David's podcasts (including The Spokesmen) were very helpful and I constantly look for the next one! My only complaint is it seems that David has a life! I wish the shows came out on a more regular basis. Yes- David does digress from time to time, but his voice is not unpleasant and it is his show after all. Thank you David! I am sure Dave is a very nice person and think of himself as fair and wise cyclist/human being in everyday life! but this podcast he produce manage to be both extremely boring, useless and bias at the same time, I have honestly try to listen to it (since jan 2012) and can no longer subject myself to such punishment! Dave, maybe you should spend more time on your bike and forget podcast! peace out! I started listening to the Fredcast 3 months ago as a way to pass time while on my treadmill. I was so pleased with the show that I decided to go back and start listening from episode #1, broadcast way back in 2006. It's been fun listening to David review new and innovative products, like the first gps units for your bike and 29" mountain bike wheels. Boy, technology sure changes fast! I find this podcast to be a fine balance between techy/fred commentary, bicycle advocacy, and general bicycle knowledge. This may not be the best place for serious racer types, but those who consider bicycling to be their most enjoyable outdoor activity will find this podcast to be very informative. Even the layperson can learn tons about cycling here. I am up to April, 2007, only about 130 more episodes to go. :) ps. Listening to this podcast has inspired me to get into shape on that treadmill and start riding again. Thanks David! David does a great job bringing a diverse set of topics of the cycling world into his podcast. His Tour de France podcast is also very helpful. He is very good at appealing and explaining to all levels of cyclists. Very enjoyable podcast. The host picks some great topics to discuss each show. Very relevant to all levels of cyclists. This guy seems like a nice fellow but this podcast is terrible. Most of the time is spent hyperbolically introing what he's getting ready to talk about and not actually covering any content. I tried to give this podcast a fair shake but it's simply a bore. OK this is unrelated to the content of the podcast but I like this because it isn't work to listen to it. The music doesn't drown out what he is saying, his speech is clear and I can understand what he is saying without straining. Of the podcasts I have listened to related to cycling this is the best produced. It is also entertaining which is why I listen to any podcast. Probably the most well produced cycling podcast. Done on more of a news show format. Provides good information on a wide range of cycling topics. The perfect blend of professional and amateur cycling to keep listeners entertained, informed and motivated. Thanks! 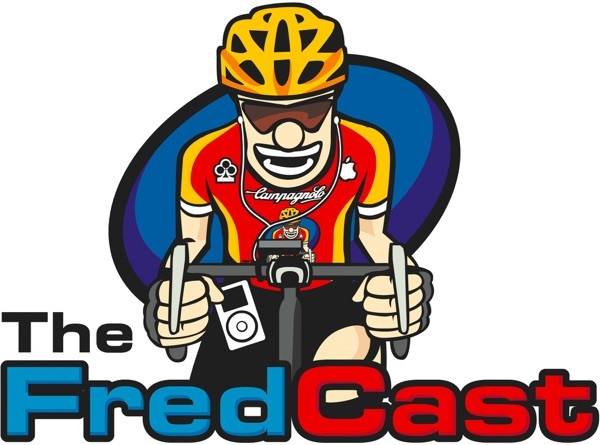 The Fredcast is the first cycling podcast I remember listening too...and it's aged well. Dave's a bit formal...think of him as the Cervelo-riding dentist on your club ride who knows enough about all aspects of cycling to keep you entertained as you log the miles, but you wouldn't necessarily go out of your way to have a beer with him after the ride's through. I particularly appreciate his product reviews, which are a strength...and his interviews are usually interesting as well...but like some posters below, I do with Dave would edit himself. We don't need the serial numbers of every product recall (especially when only 20 units were actually recalled!) so he could just give us a quick head's up about a recall, then point us to the direction of his site for specifics. My other complaint can be applied to most cycling podcasts: Their releases are erratic. Dave made a point a few months ago of saying he would release a podcast on a regular basis, about once a week or so...and has "promptly" released about 3 in 3 months! Everything in this podcast is rehash, and old news if you have any other source of cycling information. Also, if you are going to be riding on the road, please unplug the earbuds and be aware of your surroundings. I listen, but at 2x speed. Even at double speed, it is slow. Cycling is a culture that has some very diverse sub-cultures, some of which don't get along too well. This Podcast caters to the "Freds". For the unitiated, Fred is a term to derisively refer to cyclists who own equipment that's above their actual ability. David embraces his Fred status and helps the rest of us get comfortable too. Ironically, I would think that most people who dig this show will actually be pretty decent cyclists (I log about 100-150 miles per week). I've learned a lot from David and really look forward to each episode. If you have a more than casual interest in cycling, or are considering getting back in to it, then give this a try. You may even find yourself training for your first century! Starting to get comercial. David seem to go on more and more rants against police, and how they do nothing for cycling. Used to be the best cycling podcast. Hard to listen to but has potential. I like the format and the content but it's very hard to listen to. I listened to many shows and it seems as time goes on David is increasing the commercialism and is sounding like he's talking to 2 year old's more and more. Way too patronizing. Takes too many pauses in between words (I guess to get his point across or add drama) and often repeats himself (as if we can't skip back to re-listen to an important recall, etc). The other problem I have is when he's interviewing a rider or someone completely out of his league, he asks questions that must make the guy wonder why he's giving the interview (example Tyler Hamilton). Look, I almost never sandbag a podcast -- I have respect for anyone who puts the time and energy into something for which there is very little financial reward -- but as a 15-year diehard cyclist I have to say, the only reason this podcast has stayed on so long is because it was there first. Dave appears to be a fine fellow but he has absolutely no ability to edit himself. Every hour of audio has about 10 minutes of salient information. Every news item that could be handled in 30 seconds is beat to death for 5 or 10 minutes. As a (non-cycling) journalist I can recognize exactly how he puts together a show: he goes through a stack of press releases and newspaper clippings and just lets the mouth run, with no structure or awareness of how much time is wasted. I can handle the vanity that's behind all of this -- plenty of podcasts are all about the announcer's ego -- but this guy is just over the top. Crossing my fingers for a well thought-out 30 or 40-minute cycling podcast to come along and give cyclists something we can truly listen and learn from (not while cycling, please). Great podcast! David is very helpful and insightful. If you are at all intrested in cycling, you should subscribe. This by far has been one of the best podcast out there with regards to cycling. Not only does David bring you the pro racing report but any safety recalls out there before you hear it from you LBS. He truly lives & breaths all things cycling. Keep up the great work & we hope to get you to the Tour for 2010. Provides good information to help you ride hard and ride smart. Great podcast. Thanks for making a podcast that makes me; laugh at times, mad sometimes and think all the time. I never miss an episode. Love the FredCast, keep up the good work! And the enhanced versions are great! I'm a runner turned triathlete and have never enjoyed cycling as much as I have this past year. After hearing your podcasts I can't wait to go out and ride (even in the winter months)! Here's something scary that I just found out...I think my cycling clothes now outnumber my running clothes. Good tips and up to date news about cycling. Well thought out and put together, very worth the listen. Thanks to David I hammer just a little harder. Keep up the the good work! This is a must for all cyclists! This podcast is helpful and informative for all levels of cycling. I highly recommend it! My average goes up by at least 1/2 an MPH when I listen to The FredCast! David is a busy guy. He has a wife, some kids a job and he cycles. He also manages to squeeze in a cycling podcast on the side. He does miss some weeks, but David is always around on twitter. But dont think it's cut rate. David has a passion for cycling and a knack bringing useful information to my ipod on a regular basis. I like the race reports, the product reviews (how can I get someone to send me a power meter for free? ), the upcoming national event notices and lately is getting things ready for a listener bike tour. Thanks David, er Fred, for all the podcasts. Keep up the great work. I look forward to every episode of The Fredcast. David has put together a podcast that is informative and entertaining at the same time. Keep up the good work David! Awesome content and delivery. Keep up the terrific work David! The first FredCast podcast I listened to was the interview with David's daughter discussing the ride across California. Very moving and inspirational. Keep up the good work! I just recently took up bicycling and really appreciate this show. It's informative and entertaining and is a great resource for all biking enthusiasts. It provides listeners with stories, reviews, and much more. Thanks. Recently started listing, and now listening to old podcasts... it is that good. Nice combination of general cycling interest, cycling products, racing news, personal stories. I highly recommend. The FredCast was the first podcast I ever listened to. I really enjoyed it and sought out other podcasts I thought I would be interested in. The FredCast is, by far, the most interesting, informative, professional, and trustworthy cycling podcast I have listened to. I love everything about it. I really can't give high enough praise. Keep up the great work, Dave. I look forward every week to my FredCast fix...David keep up the good work! Far and away the best cycling podcast there is. Entertaining, informative, and always professional. I especially enjoy the wide variety of topics, from racing to tech to personalities. The socks are also very cool! David's coverage of races all over the world along with product reviews and tips makes the FredCast the greatest cycling podcast out there. His coverage of the Tour of California was better than any one out there, and way better than any mainstream or traditional media. Meeting David during his coverage of that race was a highlight of mine! R U listening? This show is wonderful. It is a great companion for riding since I started listening. I listen (always with just one earphone of course) in my iPod enroute to work on my cruiser, running errands on my old Maruishi RX-5. and training on my Fuji. Thanks David, for a great podcast!. If you are a recreational or competitive cyclist I am confident that you will enjoy this show. David has great product reviews as well cycling news that encompasses both professional cycling as well cycling advocacy. I really look forward to every podcast. I have found products not mentioned in the mainstream media here, and have become a cycling race fan too. I didn't even know I was a FRED untill I started listening! When I can't ride the FredCast makes me feel like I am. David is the most professional podcaster I have heard yet. Geat job! My name is really Fred and the show rocks. I recently started to listen to the show and I haven't stopped listening. Dave did a great job of covering the Amgen Tour. He does a great job of giving everyone the heads of on cycling. Keep hammering "Fred"
I discovered this in February and really like it. David comes off as personable and enthusiastic, and the show is very professionally put together. If you are into cycling you will look forward to each week's show. It is a nice blend of news, tech and opinion. I highly recommend this podcast for anyone who rides a bike and were too afraid to ask what that round thingy is. If this podcast doesn't help you become the next Lance or Levi or Ivan or Floyd, at least you'll be able to talk the talk. This is an excellent podcast! Dave breaks it down for begining cyclist and makes it interesting for individuals who have been involved in the sport for years. I just wish there was an episode everyday!